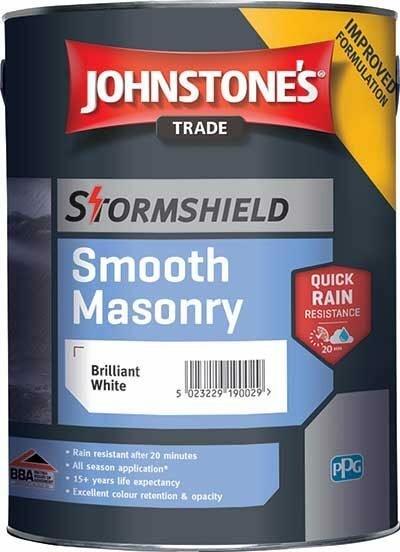 Johnstone’s Trade has improved its Stormshield Smooth Masonry product to provide quick rain resistance, enabling painters and decorators to schedule exterior projects all year round. 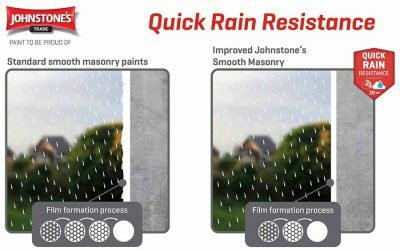 Water-based Smooth Masonry now incorporates Quick Rain Resistance technology, making it rain resistant after just 20 minutes. It can also be applied from temperatures of 2ºC, and rising, allowing all season application. Smooth Masonry paint works by improving the binding process, ensuring new paint work quickly becomes rain resistant and delivers a smooth result. The improved Johnstone’s Smooth Masonry is available in over 1,500 Voice of Colour colours. These colours have been formulated using more durable pigments which provide the most stable colours for outdoor use, protecting against UV colour fade. All the original sizes are available– 2.5L, 5L and 10L.